With brisk prose, bone-dry humor, and a profound theological vision, Eleanor Bourg Nicholson explores the demonic nature of evil, and reminds us of the power of Jesus of Nazareth to defeat it. When Bram Stoker published Dracula in 1897, he gave us a genre that—quite rightly—refuses to die. While earlier writers had dabbled in the vampire theme, Stoker’s novel codified it, and the bloodsucking Count Dracula has attained a permanent afterlife on the page and screen. In recent decades, though, our attitude toward vampires has become a bit muddled: we’re starting to depict them as merely misunderstood, as flawed or tragic, or even as romantic heroes. 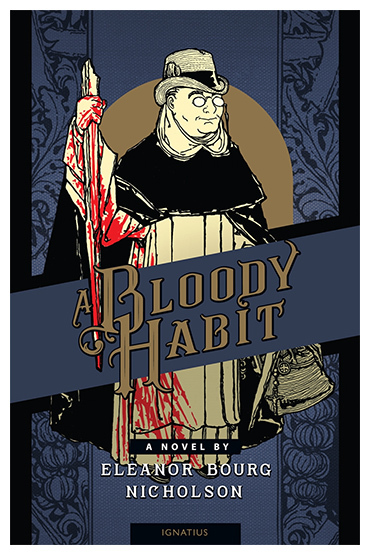 Thankfully, Eleanor Bourg Nicholson goes for the jugular of this bad idea, and her Catholic vampire novel A Bloody Habit makes a refreshing return to Stoker’s original dark picture of vampirism. With brisk prose, bone-dry humor, and a profound theological vision, Nicholson explores the demonic nature of evil, and reminds us of the power of Jesus of Nazareth to defeat it. The year is 1900. John Kemp, a cranky, stolid London lawyer, has no imagination and no interest in supernatural nonsense. His dull life has no excitement beyond the titillating divorce case of one of his legal clients. But when John Kemp meets a bespectacled Dominican priest whose business card reads “Vampire Slayer,” our protagonist finds that his tidy little modern world has been invaded by heaven and hell. A skeptic, and a sensible man, Kemp must now reckon with a series of gory murders, a sinister Romanian count, decadent English diabolists, and an inexplicable band of jovial, white-robed men who do cheerful battle with some unknown enemy. The novel is framed as Kemp’s memoir of this journey, but his real name and identity remain a secret. In Nicholson’s fictional world, the Dominican order has been tasked with combatting the vampire problem (werewolves are fittingly left to the Order of Friars Minor). It’s a delightful, scary, unputdownable novel. I laughed out loud; I felt afraid; somehow I accidentally cut my finger and bled real blood onto page 166. I am not making that up. The contrast between the Eucharist and vampirism becomes central to the novel. For Catholics, the Eucharist saves us from sin. It gives life to our spirit. It grows our capacity for love. Perversely, vampirism comes from sin and leads to sin. It makes for a kind of living death. It manifests itself in lust, violence, and hate. The Eucharist gives Christians unity; vampirism turns all other men into potential prey. It is this central Christian sacrament that the vampire imitates, eating the flesh and drinking the blood of his victims, driven by a desire for pleasure and power—and gaining an unnaturally long life. Here, this demonic perversion of Communion imbues the human being not with humility but with destructive power. The Christian Eucharist makes us freer to love; but conversely, even those who willingly become vampires find only a slavery to the bidding of their dark master. Nicholson knows how to write horror, and her book has some grisly murder scenes too disturbing for younger readers. But, as a good artist, she depicts evil as it truly is. For unless we know the problem—unless we truly and frankly confront what darkness looks like—we cannot fully appreciate the Light of Christ. Indeed, Nicholson’s novel is shot through with the understated power of goodness. At the head of the army of God stands a little Dominican priest, Father Thomas Edmund Gilroy. 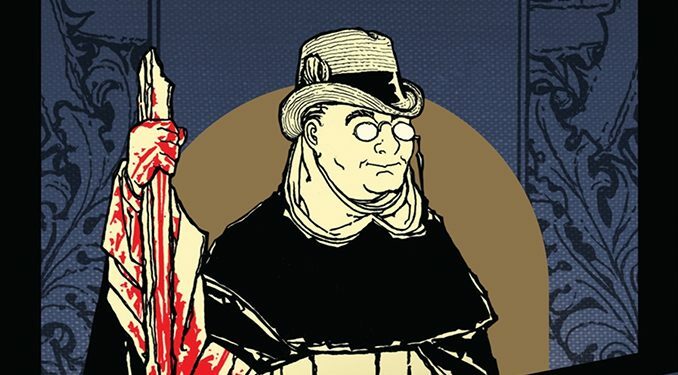 Friendly, humble, and learned—a sort of Dominican version of Chesterton’s Father Brown—Father Gilroy meets none of the expectations we have for a slayer of ghouls. As the novel approaches its terrifying climax, Father Gilroy and his chosen band of friars team up with John Kemp and the English law enforcement to form a twelve-man team. We should be thinking of the twelve Apostles, especially when one of them goes armed with a fisherman’s net. Ultimately it is God’s power, exercised in His church, that defeats the vampire: the Dominican brothers wield the powerful Name of Jesus, the rites of exorcism, and—occasionally—a crossbow. Along the way, Nicholson delivers a harrowing journey of faith for John Kemp, who must wrestle with realities that transcend his comfortable materialist worldview. And the author does this, always, with a smile. The book has some unutterably funny parts. A brilliant old Dominican who has gone slightly dotty. A blossoming romance between the domestic staff. And always the spot-on, sarcastic commentary of John Kemp, delivered by Nicholson with undead-pan humor. It’s a novel you’ll give up sleep to read, and it’s well worth sinking your teeth into. This review by Dr Franklin couldn’t have come at a better time. My hope is that I will soon be departing, on my once a year big day out. This involves a train trip to a Catholic bookshop, in my state capital city. Talk about a little kid in a lolly shop. There’s a long list of all the books I’d like to get,as well as, a short list of all the books I can afford to get. I read the interview between the author and Derya, concerning this novel. It really grabbed my attention. This review has sealed it. The vampire novel is now on the short list. It’s good to have the opportunity, to do some research beforehand, to minimize the possibility of disappointments. It should be easy enough to come by, a second hand copy of Bram Stoker’s novel. I think it would be interesting to compare the two. I also believe that it would be helpful, to return to this review and the interview, while reading the novel. From time to time at least. I could not agree with this review more! I thoroughly enjoyed this book and its tongue-in-cheek humor. The prose was rare and beautiful. All in all a delightful read! “When Bram Stoker published Dracula in 1897, he gave us a genre that — quite rightly —refuses to die.” Quite rightly? How can this be “quite rightly” when the author in the next few sentences laments today’s sympathy with vampires while we can speak even of the culture’s increasing empathy and identity with the good vampire. Dracula dies in Stoker’s novel this way: “there was in the face [of Dracula] a look of peace, such as I never could have imagined might have rested there” lending the notion that evil is not really evil. Coppola in his movie takes this further with Dracula’s death: “Where is my God? He has forsaken me. It is finished. Give me peace” (and please – no new evangelist apologetics about how Coppola was doing “midrash” or giving honor to Our Lord). Would that the genre had died in 1897. And if the “genre” is “quite rightly” still alive why are we celebrating a book that allegedly overcomes it? Vampire-killing Dominicans? Perhaps we can look forward to an uplifting movie with the Friars joining forces with the Bennet sisters and Abraham Lincoln. Father Brown and your sound reason, rest in peace. Didn’t Dracula die that way because his body was being misused, like a postmortem possession, and not because vampirism wasn’t a manifestation of evil? It could be read the way you portray it here–I can’t stand Coppola’s interpretation, and it may be his own–but I’m not sure the rest of the work bears it out. Dan, thanks for your interpretation I will consider it. A beaut little temper tantrum, coming as it does, from a man of reason. Thank you CWR, for the opportunity of commenting. I’m out of here. Farewell! Goodbye! A beaut little ad hominen coming from a man seeking a “Catholic vampire novel” Farewell, Goodbye! Vampirism is, indeed, a mockery of the Eucharist. Similarly, I am utterly repulsed by the current fascination with zombies, which I see as a mockery of the Recorrection.